DARPA's SWEEPER program has successfully integrated breakthrough non-mechanical optical scanning technology onto a microchip -- opening the door to a new class of miniaturized, extremely low-cost, powerful laser-scanning technologies for military and commercial use. The technology is 10,000 times faster than current state-of-the-art mechanical systems. Not all metal bellows are created equal. When deciding which bellows type would be the best choice for an application, 13 key performance factors or "bellows basics" should be considered to make an educated selection. To help you choose the proper bellows for your application, Servometer® has prepared an infographic that compares the performance factors of both electrodeposited and edge welded metal bellows. An MIT team has developed a way of making soft materials, using a 3D printer, with surface textures that can be modified at will to be perfectly smooth, or ridged or bumpy, or even to have complex patterns that could be used to guide fluids. The process involves a material that is composed of two different polymers with different degrees of stiffness. Very cool. Reminds us of octopus skin. When engineers at Renault wanted to create a new electric-vehicle motor design, they looked for new ways to increase driving economy and pleasure while meeting demanding mass-production requirements. Thanks to a simple model they created using Maple, they discovered, among other things, an opportunity for reducing the mass of the rotor -- the lighter the better, as the car can go further on the same battery charge. Proto Labs' latest materials-focused white paper explores metal properties and the molding, machining, and 3D printing processes used to manufacture quick-turn parts. The paper examines materials ranging from soft metals like aluminum and magnesium to hard metals like steel and stainless steel. Learn which materials bring added strength, reduced weight, and other benefits that help determine the right path to metal prototypes and low-volume production parts. A simple communications device patched together from decommissioned pieces of equipment improves air-to-ground communications amongst remotely piloted aircraft operators. Novotechnik's Contelec Vert-X 8800 Series non-contact angle sensors are a great choice for off-highway applications in harsh environments because they have high immunity to emissions. 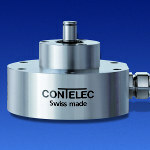 The series measurement range is 0 to 360 deg with repeatability of 0.1 deg and linearity to +/-0.1 percent. Analog and digital output versions include CANopen single and redundant, 0.1 to 10 V, 0.5 to 4.5 V, 4 to 20 mA, and 10 to 90 percent of supply voltage. CANopen versions are CiA certified. Diameter of the stainless steel housing base is 88 mm. Tested, safe, yet low in price -- this is the promise from igus with their newest line of Chainflex cables. From control, servo motor, and measuring system cables, to data, power, and bus cables, Chainflex M offers a full cable range, all designed specifically for continuous-flexing applications; at about 40 percent lower cost than traditional Chainflex cables. 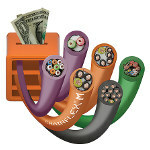 Guaranteed for up to 5 million cycles, Chainflex M cables are in the same price range as cables for non-flexing applications. 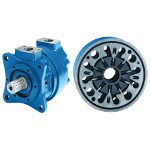 For demanding, rugged applications requiring a unique hydraulic power profile, Rineer vane motors from Rexroth provide high torque at both start and stall, and flat torque throughout the entire speed range. Its patented "vane-crossing-vane" design is engineered to deliver more power where you need it, including the unique capability to deliver maximum torque at zero rpm. The U.S. Army Research Laboratory has developed a novel, hybrid cold-spray system in collaboration with the South Dakota School of Mines that is anticipated to save millions of dollars in sustainment costs. The cold-spray process uses mixtures of metallic and nonmetallic particulates in powder form that are accelerated at supersonic velocities onto the surface of a worn or damaged part to restore it back to its original dimensions. Using electrochemistry, North Carolina State University researchers have created a reconfigurable, voltage-controlled liquid metal antenna that may play a huge role in future mobile devices and the coming Internet of Things. Engineers at U.K.-based BAE Systems have applied an upgraded Active Damping system to current variants of the CV90 combat vehicle family, breaking speed records in rough terrain and increasing the CV90's agility markedly. Demand for the Boeing 737 is at an all-time high, and production for the new 737 MAX is ramping up. See how Boeing's Renton, WA, team is evolving its manufacturing process to build the 737 MAX, which features new engines, new winglets, new flight deck displays, and the passenger-preferred Boeing Sky interior. Festo's bio-inspired FlexShapeGripper can pick up, gather, and set down several objects with a wide range of shapes in one procedure -- without the need for manual tool-gripper conversion. The gripper consists of a double-acting cylinder: one chamber is filled with compressed air while the second one is permanently filled with water. A piston, which closely separates the two chambers from each other, is fastened with a thin rod on the inside of the silicone cap. The water-filled silicone cap wraps itself around the items in a flexible and form-fitting manner.